Tambuli is another authentic dish from karnataka.It can be made using palak leaves,ginger,cucumber,Doddapatre leaves etc.The recipe remains the same except for the type of leaves used. Doddapatre leaves in English is Coleus aromaticus and Karpooravalli in Tamil.This plant is called by many names Cuban Oregano/ Spanish Thyme/ Indian Borage etc. Its botanical name is Plectranthus amboinicus..But this is how they look like! These leaves are very good in treating skin allergies and this is a great home remedy for many ailments ! It has a cooling effect when mixed with yogurt/curd. Hence, this tambuli cools your body. It helps get rid of common cold/phlegm related cough. It works wonders for constipation & acidity. Consume the doddapatre chutney/tambuli three times a day for 2 days & notice the change. For treating acidity, don't add green chilli while preparing the tambuli or chutney. Avoid coconut too. Prepare a chutney/tambuli with loads of doddapatre leaves. Doddapatre juice is consumed and applied externally for itching skin. Wash the leaves thoroughly and drain out the excess water. Add cumin seeds. When cumin seeds turn golden, add pepper & saute for few secs. Add the doddapatre leaves & saute them till the leaves wilt. Turn off the heat & allow it to cool. Transfer the leaves, coconut/Copra,green chillies,Salt to a mixer jar & grind it into a smooth paste . Now the chutney is ready. 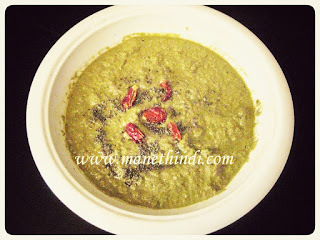 Season it with mustard seeds, curry leaves, broken red chilli, asafoetida . Now it can be served with hot rice! While eating with rice,little yogurt/curd can be added. Thanks Sreepriya!Glad you liked it! thanks for the recipe,its realy simle,tasty and most important very healthy. Are you talking about the above recipe or the paper avalakki? I have Doddipatre growing in my garden. I liked Tambuli prepared by my mother several decades back. For a very long time I was trying to find this recipe and at last I got it. Shall try it out soon. Thanks Vishku!Glad you liked it! This chutneys are so healthy.